1st NAG Mandolin Festival to take place 29/30 August 2009! There will be a two-day-festival with 2 concerts each day. Highlight on both festival days will be a performance by the marvellous team of Mike Marshall & Caterina Lichtenberg. Other performers to be announced shortly. Two of the worlds great mandolinists, Mike Marshall and Caterina Lichtenberg, join forces in a collaboration of musical styles to take you on a journey of the mandolin from it's lute like roots, in 16th century Europe, to the new world of the Americas, picking up melodies from each new place and many hands on the way. 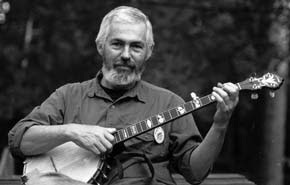 Mike Marshall is well known for building mandolin musical bridges - from his youthful days with the David Grisman Quintet, to his founding of the Modern Mandolin Quartet, and his recent collaborations with bluegrass wiz kid, Chris Thile, and with Brazilian virtuoso, Hamilton de Holanda. This time he teams up with one of the classical mandolin virtuosos of the world. Caterina Lichtenberg is now at the peak of her recording and performance career with over 10 CDs and regular tours of the U.S., Japan, Europe and South America. She is currently the Director of the Baroque Ensemble at the Music Academy of Wuppertal, Germany. Mike and Caterina first met when Mike asked her to teach at the Mandolin Symposium in Santa Cruz, California, which was a week long gathering this year of over 150 students, plus 9 top mandolinists from around the world. The two made an instant musical connection and have been building on this relationship ever since. Reservations are taken from now on. Price: 30 € each day. There are only 75 seats available each night. Please make your reservation as soon as possible. How does your band get on to the programme at IBMA's World of Bluegrass, other than by winning the title of #1 European Bluegrass Band at the European World of Bluegrass Festival? The procedures for becoming part of IBMA's World of Bluegrass - whether on one of the nineteen official showcases or one of the innumerable private 'after hours' showcases throughout World of Bluegrass week - are set out in a detailed report for the use of international bands, drawn up by Hannah Johnson, lead singer and mandolinist of the Toy Hearts (UK). The advice it contains includes the IBMA's own instructions on applying for official showcases and on hunting for 'after hours' spots, with a list of the 'after hours' hosts who presented in 2008. The last point deserves stressing: the deadline for applications for official showcases is 15 January 2009. The full text of Hannah's report can be read here. Roger Williams now plays as a regular member of Amy Gallatin & Stillwaters. They released a powerful duet album, Something 'bout you, in November 2007, and a band project, Phoenix, at the beginning of 2008. More of their exciting music can be heard on Roger's MySpace site and on YouTube. We have Joe Newberry teaching banjo and John Herrmann teaching fiddle, but only three students booked across both courses. We know it’s got nothing to do with the recession since the bluegrass courses are booking at just below the normal rate. A little slower, but that was to be expected this year with all that's been going on. Our cutoff is early January, when we book flights and totally commit to bringing a tutor over to teach. At this point, we will make a huge loss on these two courses unless we can attract at least thirteen students for each class. If it was always your intention to book, please let us know at the earliest opportunity. This appeal has been necessary every year. We are seriously reviewing the viability of the Old Time classes and whether we should run them under a totally new format which didn’t involve flying a tutor in from the US. Sore Fingers will always have Old Time represented in some form or other and we have had some very loyal support over the past years which we feel we are indebted to. So there would be an alternative, but not in the current format. If anyone out there has any suggestions or ideas about this, please do not hesitate to get in touch with us [e-mail]; we run these things for you, not us! Jean-Blaise Rochat (F/CH) is putting together a European tour for 'JB's Band' (featuring Raymond McLain, Mike Stevens, Tom Gray, Joost van Es, and himself) in the second half of May 2009. Some dates are already booked for the Netherlands and Germany, and bookings in other countries are welcome. Personally, I am honored to have been a small part of JB’s Band, and the more I listen to these discs, the more they brighten my days! Tor Egil Kreken, banjo-player of the Holstein United Bluegrass Boys (Norway), reports that on 19 January 2009 the band will release their first CD, Cattle tracks, in Norway on Grand Slam Happy Time Records. The album, consisting entirely of original material, was recorded in an old church just outside Oslo and mixed in the US with help from the legendary Gary Paczosa. Two tracks can be heard on the band's MySpace site. THUBB will be touring Norway around the release date (details to be announced on MySpace), but are also very interested in playing abroad. Promoters can contact them by e-mail. The European Bluegrass Summit meeting is to be held in Bühl/Baden, south-west Germany, on 7-8 February 2009. The City of Bühl is sponsoring a special concert to mark the occasion, to be held on Friday 6 February at the Schüttekeller on Blumenstrasse, with the Night Run Bluegrass Band (D). The concert is free to all Summit attenders; regular admission charge will be €13. The number of attenders has already reached a quorum, but there is still room for others who may wish to attend, whether as individuals or representing an organisation. Please e-mail your application no later than 24 December 2008. Your place on the Summit will be confirmed to you by 29 December 2008. Full details, including an application form, are on the European Bluegrass Blog for 12 November. Thanks to Lilly Pavlak - journalist, promoter, and all-round bluegrass activist - who sends these seasonal greetings from Bulach, Switzerland, to all lovers of bluegrass music. I have always admired those who work quietly to make the world a better place: people who dedicate their time, sometimes their entire lives, building bridges of love. These songs celebrate these unknown legends. It is my secret desire to follow their steps. This is Roberto’s fourth album since Open spaces, ten years ago. Unknown legends shows his guitar work continuing to explore and expand in eleven strong instrumental compositions - a synthesis of American sounds and Mediterranean flavors, expressed with inventiveness, energy, and instrumental precision, always arranged with an attentive eye to tradition. It features Roberto (acoustic guitar and other string instruments), Enrich Novak (dobro), Paolo Bressan (whistles), Giovanni Costantini (cello), and Stefano Versolato (upright bass), and can be bought through CD Baby. Thanks to FOAOTMAD, the UK organisation for old-time music, for the news that an old-time music session is being held twice monthly on Thursdays in Badalona, near Barcelona, Spain, at the Pub 4 Pedres, C/Lleo 33. FOAOTMAD also announce details for their 14th old-time music festival in Trent Valley Academy, the Avenue, Gainsborough, Lincolnshire, England, on 13-15 February 2009. The headliners are the New Ballard's Branch Bogtrotters from the Galax, VA, area, supported by the Foundlings, Old Yeller Dog, and the Coffin Dodgers. The programme also includes concerts, open stage, beginners' slow jam, square dancing, clogging, and a wide range of workshops, including one in shape-note singing. For more info, contact Keith Johnson by 'phone (+44 (0)1427 613643) or e-mail. The festival poster, complete with booking form, can be downloaded from the FOAOTMAD website. A reminder that anyone wishing to take part in the European Bluegrass Summit meeting, either as an individual or representing a group or association, should send in their completed application today. * To motivate people to work together more closely and to communicate more effectively. The Winter 2008/9 edition of British Bluegrass News (BBN) is due to be mailed in the next few days. The bumper-sized 32-page edition has exciting new features including ‘Favourites’ (as chosen by Rick Townend) and ‘The story behind the song’, a guest contribution from Tim O’Brien, a cover story about top UK band the Toy Hearts, a feature about Gold Heart, the US band who will be touring the UK this coming spring, area reports, and much more. This is the first edition of BBN to be published that combines the efforts of the four-man team recently established to edit and produce BBN. That team consists of Dave Bresnen (editor-in-chief), Richard Partridge (sub-editor), Richard F. Thompson (features editor) and Pat Francis (production manager). British Bluegrass News is published by the British Bluegrass Music Association (BBMA). Besides BBN, the most visible asset that the BBMA has is its website. This is being made more user-friendly and kept up to date. Work on this task is in progress and is expected to be completed before Christmas. BBMA was founded in November 1990 and currently there are about 300 members. For further information about the BBMA and this press release contact Richard F. Thompson, Press Relations, 14 Lime Grove, Lichfield, Staffordshire, England, WS13 6ER; ‘phone +44 (0)1543 252683; e-mail. Those interested in joining the BBMA can do so by contacting Trish Hockley, Membership Secretary, Freepost, BBMA: ‘phone +44 (0)7889 607612; e-mail. Ten years of Slovak bluegrass concerts in Pezinok town were celebrated on 22 November 2008. On the concert (called 'Blue Velvet Night') the great American singer and guitar player Jonathan Manness (Dixie Bee-Liners, Valerie Smith band...) performed, and the renewed 29 Strings band, a well known Slovak band that performed in 1998-2003. The founding members, Richard Cifersky, Michal Barok, and Milan Benkovic, after playing in Fragment, Meantime, Waterflow, and GrassCountry, put the band together with a new guitar player and lead singer, Martin Vitasek from the Czech Republic, and another Meantime member, Anton Naroda. More info is on the 29 Strings website. Oliver Waitze of the New Acoustic Gallery at Solingen, Germany, offers hope to anyone who doesn't know what to get for that special person at Christmas. On 5 December the European Bluegrass Blog mentioned Ruth Ellen Gruber, creator of the blog sauerkrautcowboys. She has applied to attend the European Bluegrass Summit meeting at Bühl/Baden, south-west Germany, on 7-8 February 2009. Arrangements at Bühl for the Summit are in the care of Walter Fuchs, organiser of the annual Bühl International Bluegrass Festival. The 7th Bühl Festival will be held on 1-2 May 2009. Read the Festival flyer here; a preview of the 2009 programme appeared on the EBB on 1 November. 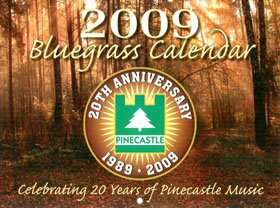 The Copper Creek 2009 Bluegrass Calendar, featuring twenty years of Pinecastle artists, is now available from the Copper Creek website, from the catalog page at the Pinecastle website, or from here (price $9.95). In 28 pages it covers not only the history of Pinecastle Records but major dates in bluegrass history. Artists featured include Chubby Wise, Charlie Waller, Beth Stevens, Ernie Thacker & Route 23, Larry Stephenson, David Parmley, the Churchmen, the Village Singers, the Osborne Brothers, Nothin’ Fancy, Jim & Jesse, the Dixie Bee-Liners, Jack Cooke, Josh Williams, Grasstowne, and the Special Consensus, who will be on tour in Ireland and Britain from mid-January 2009. Brance Gillihan of the original Bluegrass Blog draws attention today to the blog sauerkrautcowboys, run by Ruth Ellen Gruber, an American writer living in Europe. Her blog is subtitled 'Sturm, twang, and the imaginary Wild West in Europe'. Of all European countries, east or west, it is the Czech Republic where country and especially bluegrass have been most totally assimilated, or reinvented, as genuine local traditions. Read Brance's post, which quotes from both Darrell Jónsson and Ruth Ellen Gruber. The 2nd Munich Banjo Camp (7-9 November 2008) was a great success, with nearly thirty attenders from Germany, Austria, Italy and Switzerland. Instructors Rüdiger Helbig (D) and John Dowling (UK) provided an intense and varied learning programme, adjusted to suit all levels of experience and ability. The weekend culminated in a full participant concert, resulting in what may have been Germany’s largest bluegrass band. A full article on the second MBC, with more photos, will appear in German in the February/March issue of Bluegrass Buehne, and in English in the April/May issue of Bluegrass Europe. Preparations for the European Summit meeting, to be held in Bühl/Baden in south-west Germany on 7-8 February 2009, are well advanced, and applications are being received. The deadline for applications to take part in the Summit is Wednesday 10 December - one week from now. Full details of the Summit, including an application form, are given on the European Bluegrass Blog for 12 November. Anyone wishing to take part, either as an individual or representing a group or association, should send in their completed application by 10 December. Flatpicking guitarist Roberto dalla Vecchia from Vicenza, Italy, has consistently reached the Top 10 in both the Instrumental and Bluegrass monthly contests on OurStage. His song 'Grateful' won the Channel Prize for Instrumental Solo in November 2008, receiving the highest rank in OurStage's Instrumental Solo Channel! Listen to 'Grateful' on OurStage at this link. It can also be heard on Roberto's MySpace page. His new CD, Unknown legends (see the EBB for 7 November) is scheduled for release this month, with nine original tunes plus 'Angeline the baker'.